Editors's: The following was written by Bruce Upbin, Editor of Forbes magazine. A video of the gathering is available in our Video News Posting section on our homepage. OMAHA, NE - The first Forbes 400 Summit was surreal, amazing and, in the end, moving. We gassed up a Gulfstream 450 one warm September morning and flew one of the most successful recording artists of all time, Jay-Z, to meet the most successful investor of all time, Warren Buffett, on the latter's home turf of Omaha, Neb. The intent was to capture their very different perspectives on success and wealth and to talk about the social obligations that come with each. They ended up finding out they had more in common than anyone would have expected between a 40-year-old rapper from the Brooklyn projects and the 80-year-old sage of compounded returns. Neither Jay-Z nor Buffett would admit to being nervous. It was their behavior that gave them away. 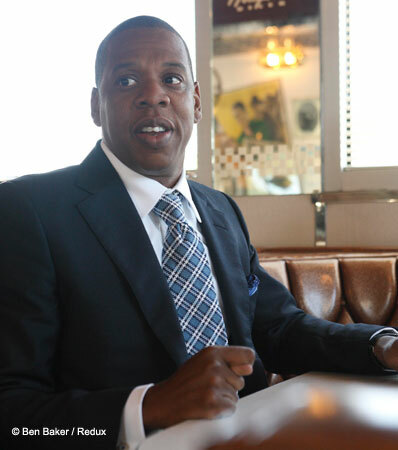 Jay-Z the wordsmith said little at first but stared at Buffett intently, taking in every word. 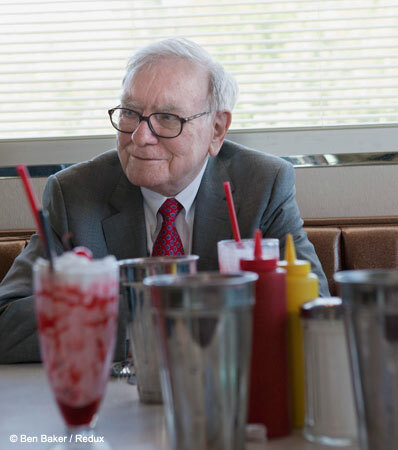 He ordered what Buffett ordered: a strawberry malt, thin. He barely touched it. Buffett never stopped talking, telling childhood stories about stealing syrup from nickel Coke machines and peeling off zingers. "When you see me reach for the check," he told the photographer, "you'll know I'm posing." They warmed up quickly and were soon laughing every minute or so. As they left Jay-Z headed over toward his Escalade. Warren called him back, "I'll give you a lift. Sit up in the front with me. My rates are very competitive." Steve Forbes: You two are unique. In very different spheres you've each reached a level of success that's almost legendary. What did you do that made you different? You don't need a lot of brains in this business. I've always said if you've got an IQ of 160, give away 30 points to somebody else, because you don't need it in investments. What you need is emotional stability. You have to be able to think independently, and when you come to a conclusion you have to really not care what other people say. Just follow the facts and your reasoning. That's tough for a lot of people. But that part, I was just lucky with. I was born that way. Warren Buffett: Well, I was lucky that I got started early. My dad happened to be in the investment business, so I would go down to his office on Saturdays. At age 7 or so I started reading these books that were around the place. I knew what I wanted to do early. That's a huge advantage. WB: I can't really tell you. I didn't learn it in school or anything. It never bothered me if people disagreed with what I thought, as long as I felt I knew the facts. There's a whole bunch of things I don't know a thing about. I just stay away from those. I stay within what I call my circle of competence. Tom Watson [IBM founder] said it best. He said, "I'm no genius, but I'm smart in spots, and I stay around those spots." SF: We were talking at dinner the other day about how in tennis, most of us are never going to get to Wimbledon. But if we just focus, get the ball over the net, don't try to be fancy about it, we'll do fine. WB: That's a little bit like these rules I have. The first rule is don't lose, and the second rule is never forget the first rule. It isn't so much having a lot of brilliant decisions, it's just not having some terrible ones. I learned from Ben Graham how to avoid ever having any disasters in investments. He also taught me to see a stock not as something with a ticker symbol that wiggles around but to think about it as part of a business. Don't get elated because something had gone up or depressed because it went down. If I knew the facts, and it went down, I bought more of it. He also taught me that famous lesson about a margin of safety, that you don't drive a truck that weighs 9,900 pounds across a bridge that says "Limit 10,000 pounds" because you can't be that sure. If you see something like that, go a little further down the road and find one that says, "Limit 20,000 pounds." That's one you drive across. SF: Jay, you're in a business even more competitive. There's not a young person in the country who at some point in their lives doesn't want to be a star. And you not only have done it but done it consistently. Jay-Z: As I was listening to Warren, I could just hear all the similarities and all the things in what he's saying, right? Because if you don't look at the tickers, you're really just searching for the truth within all the numbers and all the chaos. And that's the key to being a recording artist. You're telling your story or finding your truth at the moment. My story's a little opposite from Warren because I started a little later. My first album didn't come out until I was 26, so I had a bit more maturity. The album had all these emotions and complexities and layers that a typical hip-hop album didn't have if you were making it at 16, 17 years old. That isn't enough wealth of experience to share with the world. I had so much wealth to share with the world at that time, and I've never forgotten those things, like you say. You never forget those true things that you stick to, your basic things that make you successful. And for me, it's that truth, finding the truth of the moment, of where I am at the time, not trying to cater to a certain demographic or being something I'm not, not driving the truck over a 10,000-pound bridge. There are so many similarities in what he was just saying. So for me, it's just having the discipline, and the confidence in who I am. If I go into a studio and find my truth of the moment, there are a number of people in the world who can relate to what I'm saying, and are going to buy into what I'm doing. Not because it's the new thing of the moment, but because it's genuine emotion. It's how I feel. This is how I articulate the world. JZ: I grew up in the Marcy Projects in Brooklyn. Our classrooms were flooded. It was very difficult for teachers to give you one-on-one attention. And there was this one sixth-grade teacher named Miss Lowden. She must have seen something in me, and she gave me this attention and this love for words. It's funny how it works, just a little bit of attention. She also took us on a field trip to her house, which opened me up to the world. My neighborhood had been my world. It's the only thing I had seen. I saw a whole different world that day, and my imagination grew from there. I wanted that. I aspired to have that. The small things. She had an ice thing on her refrigerator. You know, you push it and the ice and the water comes down. I was really amazed by that. I was like, I want one of those. It's true. SF: Even though you didn't record your first album until you were 26, you were in effect writing music in your mind. JZ: I was around music my whole life. My mom and pop had a huge record collection, so I started out listening to music early on, and I would just write. I had a love for it from there. I didn't get to it, you know. I got caught into my neighborhood and my surroundings. But I've always taken it with me, and I've always gone back to it. It just got to a point where it was, like, "Make this decision, because this is something you really love and you love to do. "It's time to really focus on and then get serious about it, give it your all." And once I did that, it was no looking back from there. SF: Jay, a lot of people fade away after one or two albums. That hasn't happened to you. JZ: I think it goes back to a bit of what Warren was saying. It's the discipline not to get caught up in the moment. You know, music is like stocks, too. There's the hot thing of the moment. There's this hot, electro sound, or the hot auto-tune voice, or the hot whatever's new and exciting. People tend to make emotional decisions based on that. They don't stick with what they know, you know, this is who I am. This is what I do. They jump on this next hot thing. And it's not for you. SF: You once said that as an artist you're fighting against everything that's new and everyone's fascination with new things. JZ: Yeah, because hip-hop is, like, 30 years old. It's a fairly new genre of music. We've never seen the maturation of hip-hop in this sort of way. People would get to a certain age and still try to pinpoint at this young demographic because hip-hop is a young man's sport. But, you know, people that listen to hip-hop when they're 18 listen to it when they're 28. It's just that the voices of hip-hop are not speaking directly to them anymore. Or weren't. They're speaking to an 18 year old. I'm not going to do that anymore. I'm just going to make the music I love to make and I'm going to mature with my music. Luckily for me, it was the right decision. JZ: That was the greatest trick in music that people ever pulled off, to convince artists that you can't be an artist and make money. I think the people that were making the millions said that. It was almost shameful, especially in rock 'n' roll. Here you got these millionaire guys who had to pretend as if they weren't successful at all or it would be like a detriment to their career. Hip-hop from the beginning has always been aspirational. It always broke that notion that an artist can't think about money as well. Just so long as you separate the two and you're not making music with business in mind. At some point it has to be real when they touch it, when they listen to it. Something has to resonate with them that's real. When you're in the studio you're an artist, you make music, and then after you finish, you market it to the world. I don't think anything is wrong with that. In fact, I know there's nothing wrong with that. JZ: For a long time a hit record solved all your problems because there was no Internet, YouTube and so many other factors. It was just the music. That model still exists of just putting artists out and seeing what works. As the machine started moving faster, a lot of things got lost in the process, like artist development. It got to a point where as a business we were releasing hundreds of albums every year, and the percentages were really low, like out of 56 albums four artists worked. At Def Jam I wanted to bring the entire culture into it. I wanted a fund so I could do other things aside from signing artists, like buying a television station or a club where we can develop these artists, or putting out some headphones, all these different things. I don't think at that time they could really get their mind around that. It's not something they were willing to do. I just felt like I would be a waste there. So I started my own thing, Roc Nation, and that's what we do. We pretty much have everything: music publishing, songwriters, recording, touring. SF: Didn't you end up paying $5 million to buy your last album from Def Jam? JZ: I have a better story for you. The year I went over to create Roc Nation with Live Nation, I still had one album left to make with Def Jam. L.A. Reid, the chairman of Def Jam at the time, did a great thing for me. He allowed me to walk in and have the conversation with [chairman of parent company Universal Music Group] Doug Morris. We had a fantastic relationship. So it was very cool. I bought my last album back. What people don't know is the day before I flew from Hawaii, where I was doing some recording and put it on an iPod. I had on jogging pants, and my iPod, with all the music I recorded, was missing. It was on the plane somewhere. I had to walk into Doug's office the next day and buy an album back that might leak the next day. Every day I would wake up and check all the Internet places and everywhere. I was like that for three months. But it was worth it, you know. I was heading in a different direction and needed that freedom. It was a great decision for the company. They got some money. And a great decision for me. I got a very successful album, Blueprint 3, which had "Empire State of Mind" on it. That sold about 4 million singles itself. And my first solo number-one single came off that. I believe in everything lining up. SF: There is that element of luck you can't quantify. Warren, you've thought about luck. WB: There's lots of luck. Just being born in the United States in 1930 the odds were 30-to-1 against me. I didn't have anything to do with picking the United States as I emerged. And having decent genes for certain things. I was sort of wired for capital allocation, and being wired for capital allocation two hundred years ago in Nebraska wouldn't have meant a thing. But here I was in this soon-to-be-very-rich capitalistic system, and what I did paid off enormously in a market system like we have. If I'd had a talent in some other area that was way less commercial, I would've had a good time doing it, but it wouldn't have paid off like this. Jay said it perfectly when he talked about how he's in there recording for himself, and the money comes afterwards. I got to do what I love, and it doesn't get any luckier than that. I would be doing what I do now and I would've done it in the past if the payoff had been in seashells, or sharks' teeth, or anything else. I've had all kinds of luck. I had the luck of getting turned down by Harvard, which meant I got to study under Ben Graham at Columbia, which changed my life. All kinds of things have worked out. So I just hope I stay lucky. I've been lucky for 80 years. JZ: Yeah. There are very few people from my neighborhood that make it out. Forget about being successful, I mean making it out alive or just incarcerated. I have a great friend who just came home, one of the most beautiful people you'd ever meet; he just came home from doing 13 years. And we were together every single day. Back then there was a guy by the name of Jazz who I started out with. He had a deal with EMI. He had the opportunity to go to London to record his album. I went along with him for two months. In those two months there was a sting operation and they took my friend I'm talking about, for 13 years. The only reason I wasn't there was because I was away doing this music stuff. Had it not been for music, and music taking me out at the right time, my life could very easily have been his, very easily. JZ: There was a time in music where a hit solved everything. That's no longer true. I think the music business is still stuck in that place because we haven't figured it out. One of the biggest things in business is to open yourself up for change. We don't have to change who we are, we have to change the way we go about it. At Roc Nation we're taking our time with artist development, but there are many parts of the business that we're in. For a long time, music labels weren't into touring and now they're making up these 360 deals [where labels get a piece of everything: albums, tours, merchandise]. I don't want this to be a record-company-bashing thing but this whole 360 model is not what the record company does. The record company is not in the touring business. So why would an artist sign with you when that's not your area of expertise? We're with the biggest concert promoter there is, and there's just so many different aspects we're into to make ourselves successful: touring, producing, publishing, clothing, movies. WB: I don't want to compete with him, Steve. I'm not interested. SF: Jay, you're also wise enough, or big enough, where you don't mind sharing billing with Eminem or Bono. JZ: It's fun for me, for one thing. I don't have that ego where I have to be the only guy on the bill. I'm cool with going out with other artists. I've been doing it my entire career. Before Eminem, before Bono, it was R. Kelly or 50 Cent or DMX. I just believe in giving people a better package so when they leave the concert hall, they want to come back again. A lot of people make that mistake when they're hot. They just sell off the name and sell off the moment. We're over-delivering on the experience. SF: Warren, what advice would you have for Jay-Z in the music business? You've seen business models change a bit in the newspaper business with the Washington Post and Buffalo News. WB: It happens. Street railways were big here in Omaha 100 years ago. But I will say this about investing: Everything you do earn is cumulative. That doesn't mean that industries stay good forever, or businesses stay good forever, but in learning to think about business models, what I learned at 20 is useful to me now. What I learned at 25 is useful to me now. It's like physics. There are underlying principles, but now they're doing all kinds of things with physics they weren't doing 50 years ago. But if you've got the principles, if you know what makes a good business, if you know what makes a good manager, if you know what makes a good product, and you learn that in one business, there is some transference to other businesses. As you go along, you learn what things you're not going to understand. Knowing what to leave out is just as important as knowing what to focus on. Somebody said how to beat Bobby Fischer; you play him any game except chess. And so I don't play Bobby Fischer at chess. SF: Warren, you said you wouldn't want to compete with Jay. What advice would you give? SF: You've said businesses need to build moats around them. What kind of moats should Jay-Z be building? WB: Well, he's building moats all the time. Obviously. That's why he's succeeding even though he's moved beyond the age that you normally associate his field with. The best moat you can have is your own talent. They can't take it away from you; inflation and taxes can't take it from you. I urge students when I talk to them to look at the people you admire and list what makes you admire them. Those are things that you should do. Just write them down. WB: He can do things I can't do, believe me! I can't do anything he does. WB: If you go back to when I was in my 20s, this sounds obnoxious, but I really did know I was going to become rich. I'd learned something that was going to work. And my wife and I decided then that we were going to enjoy life. We were going to have everything we'd possibly use or need. Incidentally, I think a $5 dinner is better than a $100 dinner. I felt, one way or another, all that money would go back to society. I thought my wife would outlive me, and she was the one who loved the process of seeing people with problems that money would help. I thought we would pile it up and she would do the distribution of it. But the big money was going to be later on, and then she died while I was still alive, and then I had to make a decision as to the best way to get this money spent in an intelligent way, relatively promptly. I came up with the idea of splitting among five foundations, the largest of which is the Gates Foundation. That was four years ago. I couldn't be more pleased with the decision. WB: Ten years after my estate's completed the money has to all be spent. It can't go to institutions which in turn put it in their endowment or anything like that. I want it with people that I know are in sync with me, and I know will be true to certain ideals. I want them to dispense it because who the hell knows 50 years from now, you know, when the place becomes some large institution, what will happen. SF: Have you denied society something in that the capital, if you'd keep employing it, might have done more good in invested in more companies? WB: Well, Berkshire is still around. I'm still running it. JZ: Yeah, it's not doing so badly. WB: I think it's been a perfect solution. When my wife was pregnant, I didn't think I was going to deliver a baby. If I get a toothache or something, I don't take out my own tooth. I turn it over. I follow Adam Smith's advice; turn it over to a specialist. And there's no reason to think that because I'm good at making money, that I would be the best, necessarily, at distributing it. Foundations are not tested by a market system. I mean, if you've got a business idea, and he's got music, it's being tested by a market system. People will make a decision is whether that next album is good, and they'll make a decision, you know, on whether Coca-Cola still keeps them happy, and all that sort of thing. A foundation has no market tests. So it's very easy to start rationalizing things that are a long way from what you thought you were setting out to do. SF: Jay, you're just beginning to look at charities. You have the Shawn Carter Scholarship Fund. Where do you see it going? JZ: The reason I've focused on that is because such a small thing changed my life, right? A sixth-grade teacher said, "You know what, you're kind of smart." And I believed her. I said, "I'm smart, right?" So she gave me that sort of opportunity. She sparked that idea in my mind. So that's why my first thing is a scholarship fund, because there are a ton of very intelligent kids coming out of these urban areas who can make it all the way if given the opportunity. It's a challenge that I gave to my mom. And my mom is so involved with it. She gets on the bus, and she takes these kids to their interview with colleges. And now we're starting to see kids graduate from college, and I'm getting that sort of feeling when it's real, you know. I'm not just sitting home, writing a check to make myself feel good. It's something I really want to do, and I'm into it and excited about it. WB: It's tougher than business, Steve. You're looking for easy things to do in business. If people have liked drinking Coca-Cola for 100 years, they'll probably like it for another 100. It doesn't require great brainpower to figure that out. In philanthropy you're tackling the tougher problems of society, things where people have applied money and intelligence before and haven't really solved the problem. Education is a great example. Gates is working on eradicating polio. They have gotten 99% of the way there. But that last 1% is very tough, and nobody knows for sure if it will get done. SF: Warren, one of the things you do in your annual reports is discussing what went wrong and what you've learned. WB: Part of making good decisions in business is recognizing the poor decisions you've made and why they were poor. I've made lots of mistakes. I'm going to make more. It's the name of the game. You don't want to expect perfection in yourself. You want to strive to do your best. It's too demanding to expect perfection in yourself. WB: The way I got the message out was to get a copy of FORBES, look down that 400 list and start making phone calls! Bill and Melinda did the same thing. We only called 80 or so people so far, some I know, and some I don't know. We've gotten a way better reception than I thought. In many cases we picked people that we knew already had pretty strong philanthropic interest and, in a very low-key way, asked them to sign a pledge, not legal but moral, that they would give away half their net worth in their lifetimes or at death. About half of the people we asked said they'd be delighted, and we asked them to tell their stories on our website [givingpledge.org]. They are fascinating to read. I don't think you'd see anything like this in parts of the world outside of the United States. We'll see how far it goes, but even if it only goes as far as it's gone it will have a big impact. I've already learned something from the three or four dinners we've had with people. We will have smarter philanthropy in this country 10, 20 years from now, and in a small way this will contribute to it. So keep publishing the list so I can milk it. SF: Jay will soon be on it. Jay, how do you get the message out to your audience that giving doesn't have to be dollars? It could be time, like the way your sixth-grade teacher did? JZ: As entertainers, we're the first generation to capitalize on our talent. For many years artists were dying broke, because the record companies took advantage of them. I'm not talking about rock stars, like Bono. The first thing for me is to lead by example and show how these things have an effect on people's lives in a real way. I know there is a future generation of stars in my old neighborhood that we must help out, to become what they could be if given the opportunity. So my first thing is to show by example and pull a guy in like Puff [Daddy]. We made a huge pledge to Katrina together. I think we could have done more. It showed hip-hop the power in doing things together. We'll move forward from there. WB: They'll probably say Berkshire Hathaway. I hope it's still around then, doing very well, too. If it isn't I'll come back and haunt 'em! No, but what I've done has not been very complicated. I followed somebody else's teachings. I guess if you could pick one word it would be "teacher." Jay has talked about his sixth-grade teacher. I think almost anyone that's been successful has had a teacher, somebody that's affected them. If you can pass that along, I think that's better than money, actually. WB: Jay is teaching in a lot bigger classroom than I'll ever teach in. They're going to learn from somebody. For a young person growing up he's the guy to learn from.